During my visit the Lincoln Park Zoo in Chicago, I came across a carousel that was a bit unusal. Instead of fancy decorated horses, the carousel had near extinct animals, each fastened with a saddle and rein. It was eerie to watch the children ride in circles, innocently pretending to tame the animals. 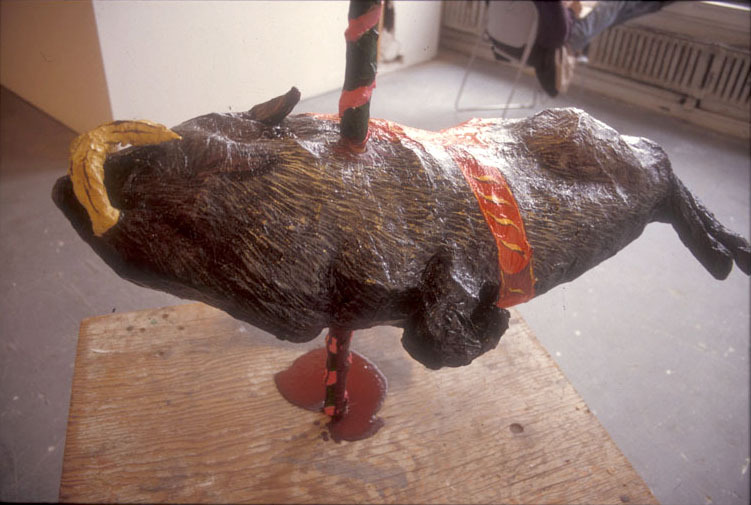 I made a variation on the wild boar from the carousel as a response. The piece was accompanied by a tape recording from the park. By dragging the trolly on its rope, the piece circled the gallery space as a performance.